The Chicago Bears realistically have a need at both tackle spots. Signing free agent tackle Riley Reiff upgrades the line. One of the Chicago Bears‘ biggest needs is the tackle spot. Charles Leno and Bobby Massie are average at best. After a slow start, Massie straightened out late in the 2016 season, but spending the eighth-highest salary for an average right tackle doesn’t help the team. The Bears have a very good interior line with Kyle Long, Josh Sitton, and Cody Whitehair. Adding help on the outside makes the line even better. There is this perception that the offensive line is just horrible. However, the fact of the matter is that they are a top-ten line. They ranked seventh in sacks allowed and eighth in sack percentage. Also, they opened up a lot of holes for Jordan Howard to run into the Chicago Bears’ record book. Of course, once that perception is made, it is difficult to knock it down. One of the ways to knock down that perception is by signing Riley Reiff. Reiff is a 2012 first-round pick of the Detroit Lions (23rd overall) out of Iowa. He is an upgrade at whatever side he plays. He played left tackle during his first four seasons. In 2016, he moved over to right tackle. One of the troubles the Bears offensive line had this season was injuries. The line at the end of the season was starkly different from that of the beginning. Reiff helps at that area. In his five seasons with Detroit, he played in 77 of a possible 80 games. Of those games played, he started in 69 of them, so he has the experience you want, even though he is still a young 28 years old. 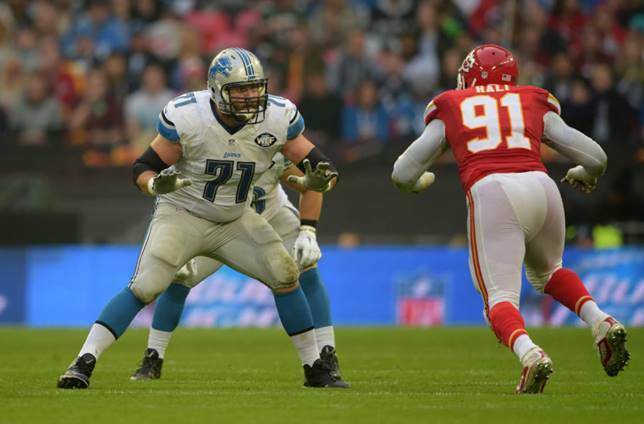 Looking at why Reiff may leave Detroit, you only need to look at where he plays. There is a big discrepancy in how much a left tackle makes compared to what a right tackle makes. The left tackle is usually playing the quarterback’s “blind side” so having a good one is essential to winning games. Reiff hopes to show he can play his old position and cash in on that. Former agent, now CBS Sports analyst Joel Corry spoke about the monetary difference between the positions (via the Detroit Free Press). The Lions have to figure out what they’re doing with their offensive line cause they got two guys up and there’s one that should not re-sign without testing the market if he is going to come back and that’s Riley Reiff. To me, his best bet is trying to find someone who’s going to pay for his versatility or pay him to be a left tackle, cause left tackles and right tackles, it’s like apples and oranges financially. With a scarcity of tackles in both free agency and in the draft. That works to Reiff’s advantage. He is an attractive asset for a team needing a tackle. With the need the Bears have, signing Reiff would be a great move. He helps change the perception of the line. The team probably still drafts a tackle in the draft, but that player doesn’t need to feel the pressure of handling the line right away. Reiff also helps the coaching staff by being able to pick the system up quickly. After a 3-13 season, getting victories is the most important goal of 2017.